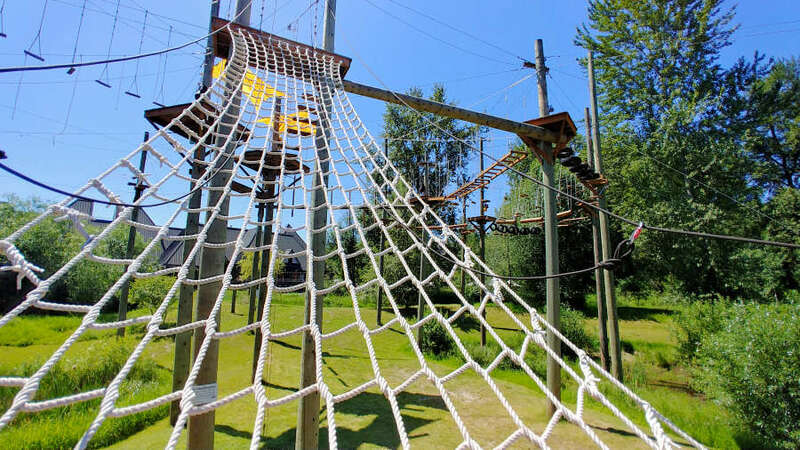 When most people think of Woodinville, Washington it’s most likely for the wine, not an aerial adventure park. With over 100 wineries it is one of the best small towns to visit for a wine vacation. While working on an aerial adventure article, I discovered Adventura, an aerial obstacle course in the heart of the Hollywood District in Woodinville. While chatting with the owner, it sounded like so much fun, they invited me and a friend (the hubs) on a playdate. 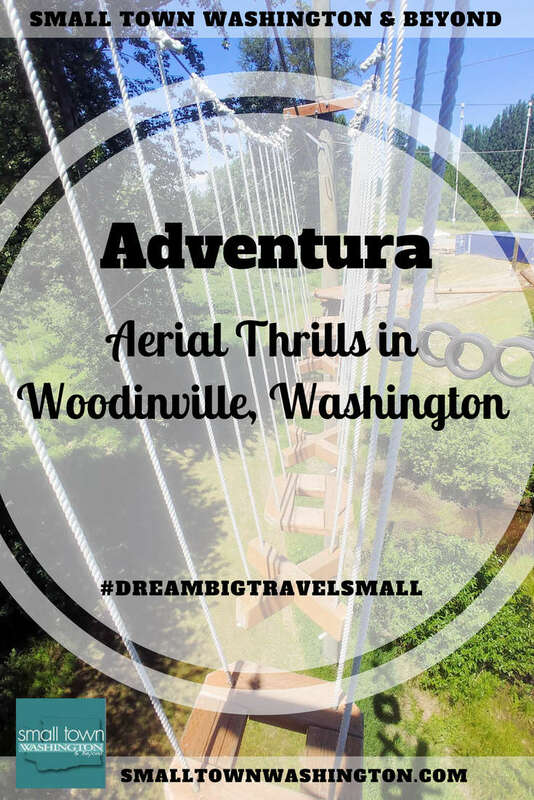 On a sunny Sunday, we drove to Woodinville for our aerial adventure with Adventura. I have to admit until we arrived, I didn’t think about how high the course would be. Then, I saw what 50 feet off the ground looked like with my own eyes. That’s when the nerves set in. I’ve found some great deals on LivingSocial, including deals from Adventura. We had around ten minutes until orientation, which meant there was plenty of time to gaze up at the aerial obstacle course and ponder its dizzying height. I snapped photos to keep my mind occupied until everyone in our group arrived, and we could gear up and go through orientation. Your guides do not speed through orientation. In fact, they repeat things, and it’s not to be annoying, but to make sure what they are saying sinks in. I’m assuming they know that everyone has their own fear factor, and by repeating key phrases and words, one of those times, you’ll hear it. The process is around 30 minutes, and it includes putting on your gear, learning about the ropes, how to use carabiners, how to work with your buddy to make sure you stay safe on the aerial course, and the best way to climb the rope ladder to get up to the course. Time is allowed for hands-on and interactive demonstrations, so you are comfortable with your gear and each other before going up on the course. Once you’ve made it through orientation, its time to play! The hubs and I were the first up on the course, so we plotted our direction and moved our way through the aerial obstacle course and its challenges. There is no pressure to do the aerial challenges. You can do as many or as little as you want. There is no pressure to complete the aerial course, and you can leave at any time. The guides stay up on the course and are spread out in various locations. They are there for direction, help, and support. We did most of the challenges and found most to be fun, and of course, challenging. One, neither of us liked, as it demanded a lot of physicality from your upper and lower body. I’m not sure what that challenge is called, but it is next to the zip line and has spaced ropes with single pieces of wood at the end. None of the ropes or wood are connected to each other, so it is easy to get tangled as you make your way from one to the next. You’ll get a work out on the course, so drink water beforehand, and bring a bottle of water with you. They put all waters in a bag and bring them up to a centralized location on the course, so you don’t have to worry about lugging it up there yourself. Wear comfortable clothing and fabric that breathes. Wear closed toed shoes, like tennis shoes. Bring a hat. Most hats will fit under your helmet and help to keep any glare from the sun out of your eyes. Put on sunscreen at least 30 minutes before your scheduled time. That way it has absorbed into your skin and will not grease up your hands. While you might be tempted to have a glass of wine or a pint of beer before your adventure to calm your nerves, don’t. You’ll need all your wits and coordination. After you’ve completed the course, one of the guides will ask if you plan to check out the area’s libations. If you are, they’ll give you a card for a dollar off a glass of wine or beer at a nearby location. We stopped by Sumerian Brewing Company and then headed to Tavern on the Square at McMenamins Anderson School for a bacon cheeseburger. Heck, yes! You are up high, and it does make your stomach flutter, but once you work through a couple of the challenges, that fades (slightly) and the thrill sets in. Plus, with the buddy system, it is a fun way to bond with your friends or family. We had such a great time and were still talking about days after. Thus far, it is one of the most fun and scariest things I’ve done. Woodinville is a 30-minute drive from Seattle and a 50-minute drive from Seattle-Tacoma International Airport. Adventura is at 14300 Northeast 145th St., and almost directly across from Chateau Ste. Michelle. If you are staying in Seattle, you can easily make a day trip to Adventura, just keep in mind the morning and afternoon traffic. If you are looking taste wines after your time at the course, I suggest staying overnight. For a luxury stay in Woodinville, look no further than the Willows Lodge. It is a short walk from Adventura, The Herbfarm, Chateau Ste. Michelle, and a wine tasting walking trail, that also includes breweries and distillers. The hotel is pricey, but it puts you in the heart of the everything you’ll want to explore and Woodinville wineries, so you don’t really need to drive anywhere. They also have free bicycles for guests. For a brand hotel, the Hampton Inn & Suites is a 10-minute drive away. And, if you prefer B&Bs, the Hideaway Lodge Bed and Breakfast is a five-minute drive away. In Bothell, is another fun place to stay – McMenamins Anderson School. It is around a 15-minute drive away, and once you are there, you’ll most likely not want to leave as it has a few dining and bar options, outdoor patio with fire pits, a movie theater, and pool. To find more hotels and read reviews go to TripAdvisor, Hotels.com, and Expedia.com. As is common in the travel industry, the writer was provided with a playdate for the purpose of review. While it has not influenced this review, the writer believes in full disclosure of all potential conflicts of interest. Although I’m terrified of heights and not likely to give this a go, my daughter (and regular traveling companion) would have a blast! Sage, If you are really scared of heights, like to the point it freezes you in your tracks, this wouldn’t be a fun way to spend the day. The hubs is more terrified of heights than I, and surprisingly, once he got up there and we went through a few challenges, it wasn’t so bad. We clambered on one of those parks in Australia. We realised how un-graceful we have become as we age. But boy, oh, boy was it fun! I guess the big tip is to not go there after the winery…. It might get a little dangerous. I used to work in Woodinville (Golden Egg Ski and Sport) during my Steven’s Pass part of my ski bum journey. Adventura looks like a fun little ropes course. It’s such a beautiful area out there, it’s hard to go wrong with anything that you do. Jenn and Ed, How cool! I agree! Great area! I am scared of heights but this looks like an awesome adventure for those who aren’t! Adventura seems like a good place to reconnect with the child within you. I’ll definitely share this with my friends. Mohana and Aninda, It is super challenging for people scared of heights. Thanks so much for sharing! I’ve got a pair of teenagers who would absolutely love this! We have a few aerial adventure parks in Vermont, but they are not as big, or as high as this one. Sounds like so much fun, especially if you can wrap things up with some wine afterwards. Tara, Your teens would totally love it! Neha, That would be a fun aspect about living on the army base! There was a family on the course with us. The kid was having a grand time. This sounds EXACTLY like my experience with the Adventure Center of Asheville. They asked me to try out their obstacle course (in addition to their zipline). Same thing with orientation and demonstrations. I found the carabiners really interesting. And you are SO right that it is fun but physically challenging. And definitely celebrate afterwards! We had drinks and sushi and didn’t worry about a single calorie after the daytime work out we got! I would definitely try the Adventura Aerial Park out! That looks like so much fun. 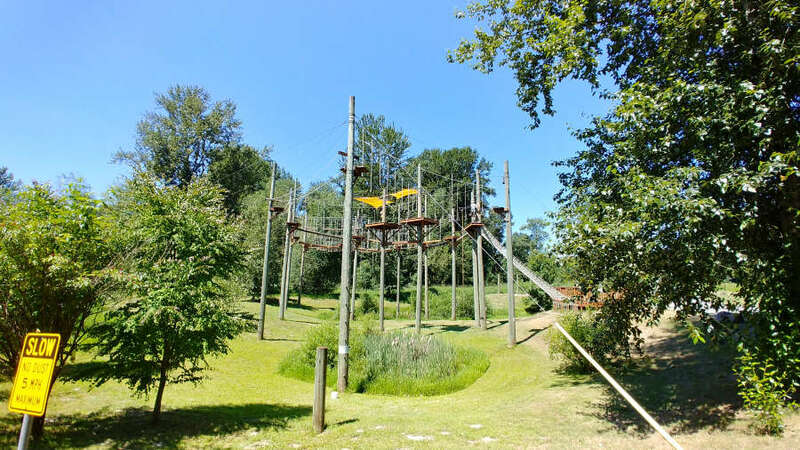 It is amazing to see adventure parks like this crop out of what I knew, as a younger person, as simply a ropes course. 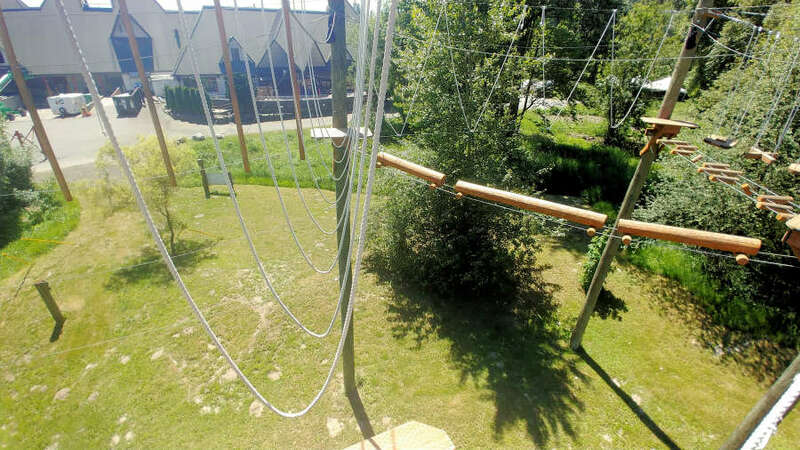 High altitude ropes and other balancing obstacles strung between trees or rocks that would challenge your sense of balance, spatial awareness, fear. Michael, It certainly challenged me. Super scary and super fun! We love ziplines – cool that there are adventurous activities her. Sounds like a trip to the winery would be fitting after a day here as a reward! Yes! Thanks so much for commenting! Wow, what an adventure! You got some great action shots. I’d love to go here with my family and then go wine tasting with my husband 😉 Best of both worlds! Carmen, Wine tasting after is certainly a huge perk! Especially, when you can walk right across the street to Chateau Ste Michelle!